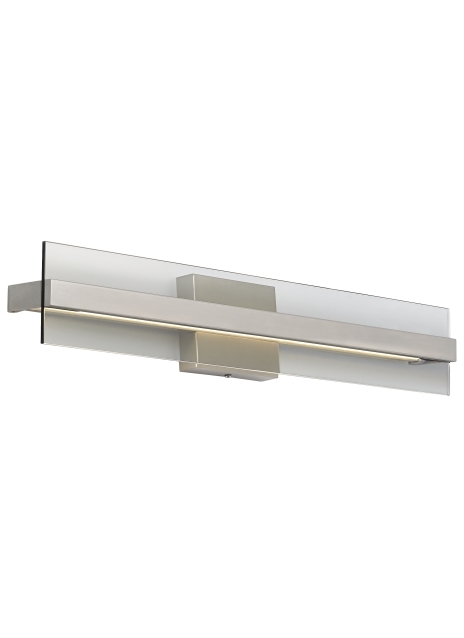 The Windrush wall sconce light by Tech Lighting is modern and sophisticated in design featuring twin glass or acrylic panes and a decorative metal center. A special co-extruded remote phosphor LED light source back-lights the panes for a beautifully smooth wash of light. This highly customizable wall sconce is available in two sizes, three on-trend finish colors, three shade colors and two unique detail styles. Due to its two sizes options the Windrush is ideal for bathroom lighting flanking a vanity, bedroom lighting flanking two end tables or hallway lighting. For even further design freedom the Windrush can be mounted vertically or horizontally. Your choice of LED lamping ships with the Windrush saving you time and money, all LED lamping options are fully dimmable to create the desired ambiance in your unique space. 1' version includes 14 watt, 238 delivered lumens, 2' version includes 20 watt, 514 delivered lumens of LED’s. Both available in 4 CCT options and 2 CRI options. May be mounted horizontally or vertically. ADA compliant.